Removing ‘clutter’ to open the Mall up to increased pedestrian traffic and open up views to the sea. Upgrading existing shade structures to become key ‘event’ spaces in the CBD as well as give identity and character to them. Introduction of a central row of large shade trees with new seating nodes. Introduction of compact children’s play equipment (a ‘play trail’). Taking out the ‘suburban style’ existing structures. Creating a shaded al-fresco dining space off existing building overlooking raintree park with lightweight self supporting awing structures. 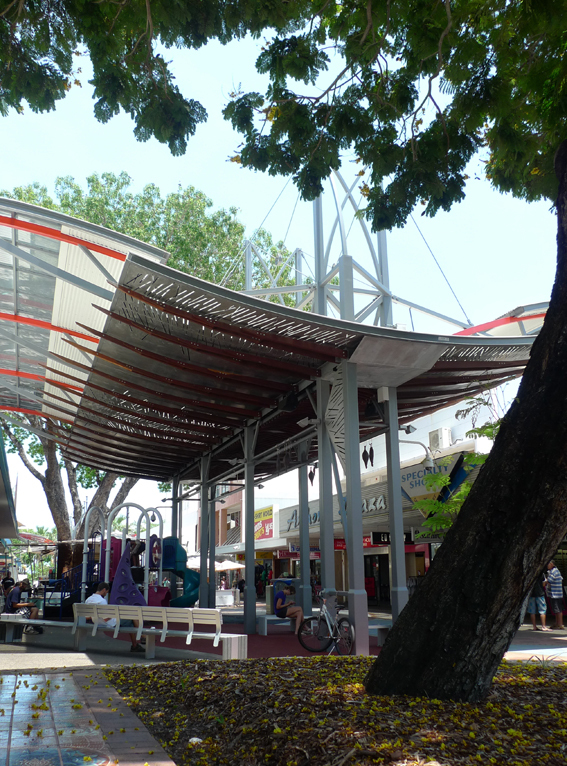 Redesigning Raintree park to provide better connections and opportunities, keeping of course the 2 iconic raintrees and fig that identify and provide attractiveness and coolness to the place.